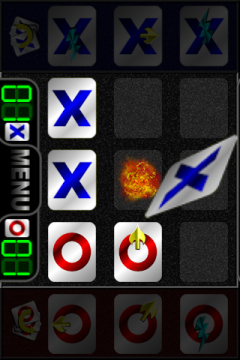 Logic Battleships is an arcade version of the classic pencil and paper game known as Battleship Solitaire. The enemy's navy is making its way to your primary coastal base, you must find and destroy their fleet before they attack. This wont be easy, the enemy has a system of hiding its ships, and the only way you can pinpoint them is by using a number system that helps you determine their location. 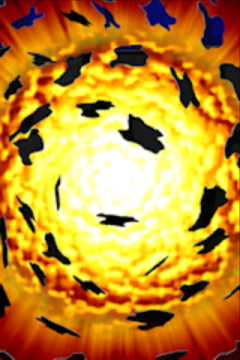 Can you use your logical might to defeat your enemies navy before its too late? Get ready to play the craziest Foosball game for your iPod. Try and get that ball into your opponent's goal before he gets that ball into your own goal. Unlike many other table soccer games, Foosball World Championship offers the user to perform many tricks. You and only you are in full control of your player rods. Slide them, spin them or manually move them forward and backwards to perform nice combination shots. Foosball is very easy to pick up but also very challenging for those pro players. -Really smooth full 360 degrees screen scrolling. -Impressive Artificial Intelligence making for the most enjoyable experience. -Enable/Disable auto goalie for players 1 and 2. -Play vs iPod player or take on any of your friends and family in 2 player mode. -Play in three different football pitches each with their own unique play and visuals. -Play in 4-4-2 and 4-3-3 formation settings to play defensively or offensively. -Play as any of the 32 Qualifying Teams. -Each team offers its own skill level. -Nice colourful cartoon graphics representing all National teams. -Take on the ultimate challenge in Tournament mode and claim the Trophy as your own. -Tap screen with one finger whilst moving from side to side to move the rod sideways. -Move your finger upwards or downwards to kick ball softly in that direction. -Tap screen with two fingers to make players spin and kick ball harder. -The rest is upto you to explore. 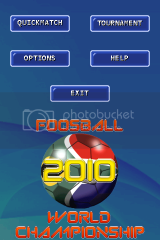 Foosball World Championship 2010 offers the best gameplay and control at an amazing price. At long last, the award winning puzzle game B'lox! is fully updated and available for the iPhone/iPod Touch! Slide the coloured blocks onto the pads. Once all pads are covered with a like-coloured block it's on to the next level. The first mechanical baseball pinball machine to hit the app store. Do you want to test your book knowledge? Do you want to challenge your friends to see who knows more books? Now you can train and sharpen your skills by playing QualeAutore” and enjoy challenging your friends. This application uses a database with more than a thousand titles including bestsellers, classics, and modern romances, by authors from all over the world. For example, the program can ask you who wrote “Pride and Prejudice”, “The Divine Comedy” or “The Andromeda Strain”. The game can be set up according to your preferences, such as the amount of time to answer the questions, the number of errors allowed, and the total number of books you want to be tested on. A book will not show up twice during the same game. You answer the questions by picking the right author among the three given choices. There are two ways to play: single-player or multi-player. With the group option, the players challenge each other with a different book color, one red and one blue. What are you waiting for? 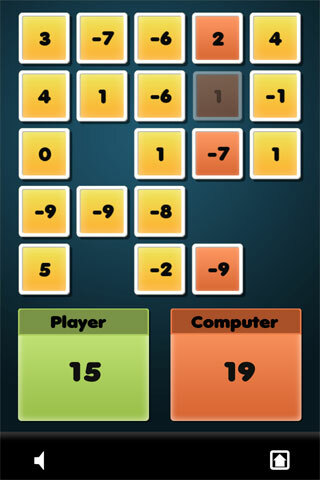 Enjoy playing “QualeAutore”! In addition to customizing your settings, you can choose to play in either English, Italian or Spanish. The list of books varies upon the language chosen. 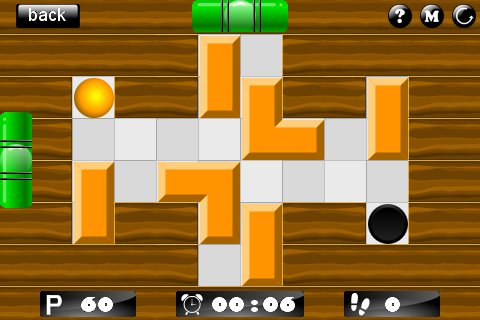 Triple Dutch was updated today, the update brings 15 new cheese puzzles and some minor fixes. will not be able. After many tries, you can repeat the trick and... the coin will dissapear again! 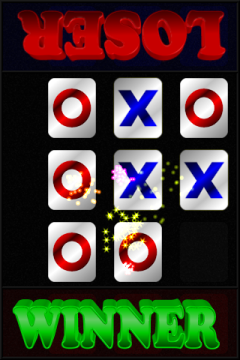 Game Name: Tic Tac Blam! So there you are, waiting for your food at a restaurant, or waiting in a line for your number to be called, or any number of other times you have nothing to do but wait. Maybe a friend or two is there with you, sharing in your misery. 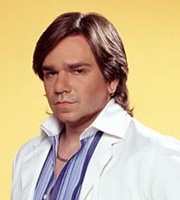 Just then, someone pulls out their iPod and starts playing Tic Tac Blam!. The colorful animations draw you in. They glance up and notice you watching. "Want to play?" they ask, switching the game from one player to two with the tap of a button. "But I don't know how," you reply. "It's as easy to learn as tic tac toe, but much more fun," comes the answer. In no time at all you read through the short tutorial. The game begins and you quickly start forming strategies, using your cards to block and attack. The games start racking up. You grin as you finish a round with a Blam! card, making all their cards fly off the board. It's all tied at five games apiece, when suddenly your food arrives, or your number is called. The wait felt like hardly any time at all. A slider puzzle made up of pictures of pets. 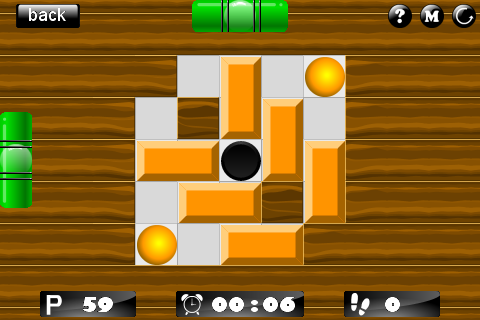 As well as the standard sliding tiles it also allows the player to rotate the tiles with a single tap. The player can also listen to their own songs from the iPod song list while playing the game. This game needs little to no introduction. 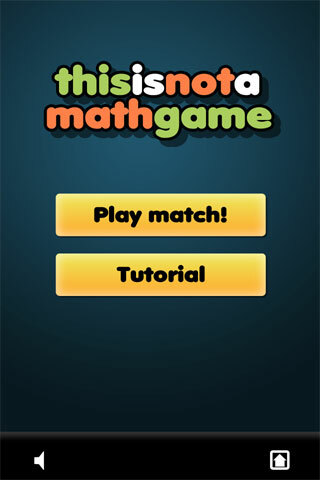 The most popular game has arrived for your iPhone / iPod / iPad. Get ready for hours and hours of enjoyment with this classic 'American Poker' game. It is based on the all time favourite Poker slot machine. It plays just like the real thing and even better. Classic mode: Play with the same color and settings, just like playing the real thing (my personal favourite). Mode 1: An improved version with nice colourful text, borders and shading (for the boys). Mode 2: An improved version with nice colourful text, borders and shading (for the girls). 'Jacks or Better' (Mini Bonus). Ability to 'Double Up' your winnings using the popular 'Red / Black' gamble feature. Be Warned! Highly Addictive! Top 100 World Online Scores. Hopefully more to come in future updates. Automatic save feature so you don't have to start from zero every time you play. Control could not be more simple, just press the deal button to start. Touch cards to Hold/Release them accordingly. Raise your bets to play at a higher stake. More information in the in-game extensive 'Help Menu'. Just remember that once you buy it you will no longer have to spend any more of your valuable cash on the real slot machines. What are you waiting for, grab your idevice get the best, fastest most addicting poker game and become the worlds No.1. THISISNOTAMATHGAME is the perfect time waster. Instantly train your brain and boost overall mental power and performance with this little challenging game. In THISISNOTAMATHGAME you run against an artificial intelligence. Considering 4 different grid sizes there is no place for boredom. Face up to this enormous challenge, and show yourself that you are brighter than the machine. 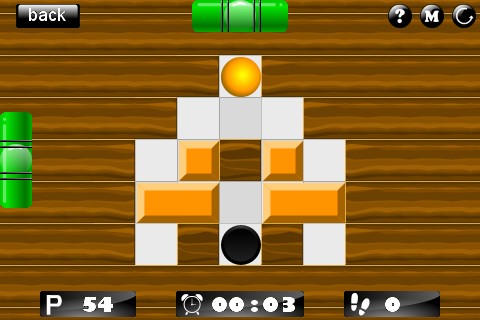 In THISISNOTAMATHGAME the player competes with the computer for the high score by picking tiles of different value from the board.The player and the computer choose alternately a tile from the board. The position of the player`s choice determines the column or row of the computer`s turn - and the other way around. The game ends when there is no tile left for the player`s or computer`s turn. THISISNOTAMATHGAME is playful and challenging at the same time. From time to time it is pushing your mental power to its limits. If you love kittens then this is the game for you! Slide the pieces around to build the picture or tap to rotate them. And did I mention it is free? If you like it then buy the full version (see shopping trolley in options) and get access to puppies, cats, dogs, and more! The Poker App that will occupy every spare minute of your day. Take Poker to another level of fun! Hundreds of other players have already joined the Poker sensation. Now brought to you exclusively for the iPad with stunning graphics, sound and extra features. Take the Poker Machine in the palm of your hands for an amazing price. Don't miss out. I listen carefully to people's feedback and always try to provide to them what they want. People were asking for more credit, so extra credit has been awarded, not only this but I have included a really cool new feature. The top score has an impact on how you play. For example: The top players will get even extra credit as long as they remain in the Top 3. More features will surely come shortly. Basically what this means is that the Top players will get nice rewards. Please rate and/or review this app. The most popular, easiest game has arrived for your iPad. Get ready for hours and hours of enjoyment with this classic Poker game. Are you tired of losing your cash in the real slot machine, but yet, you really enjoy playing this simple but very addictive poker game. Well now is your chance to spend all the time you want playing this entertaining app. Buy once, play forever. How many times are we just relaxing at home after a hard days work, or waiting for the bus, train etc. Minutes can seem hours. Well worry no more, from now on you won't mind waiting for the bus as soon as you bring out and launch this Poker App. It's amazing on how easy it is to pick up and play. You will be enjoying this game from the first minute you run it. It's incredible on how such a simple game can have you hooked for hours and hours. 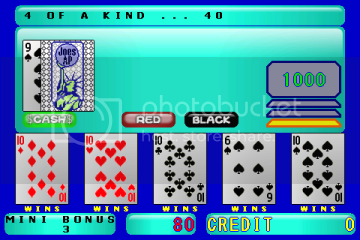 Classic mode: Just like the Poker slot machine but with improved graphics across the board. (my personal favourite). All your favourite winning combos, Listed from highest to lowest points. * '5 of a kind'. * '4 of a kind'. * '3 of a kind'. * 'Jacks or Better' (Mini Bonus). Top 150 World Online Scores. Hopefully more to come in future updates. What are you waiting for, grab your iPad get the best, fastest most addicting poker game and become the Worlds No.1.